Is it a slate? Or is it a netbook? Intel has introduced the latest design of its low-cost, education-focused Classmate PC this week, with the emphasis on developing an ecosystem around the needs of younger children in primary education. Intel's new Classmate PC hardware features an updated version of the Atom processor series, an Atom N450 at 1.66GHz, with optional GPS, Bluetooth, 3G and WiMax connectivity. The new Classmate PC will be branded as the FizzbookSpin in the UK. Tristan Wilkinson, Head of Public Sector, Intel EMEA, said of the new machine: "The new classmate PC design is based on extensive research from over 30 pilot classrooms around the world looking at how students learn, how they use and engage with technology, and how teaching has evolved. The new classmate PC is durable and lightweight, with additional ergonomic features such as rubberized surface for easy grip and a comfortable, low-profile handle that supports a variety of holding and carrying positions. "Equipping students with the best learning tools from an early age will open up opportunities for them in life and work. We are committed to providing comprehensive technology solutions, which both support teachers in the classroom and provide the best learning environment for students." The new Classmate hardware comes with hard drives up to 160GB and also features a touch-sensitive 1366x768 10.1-inch screen. Interestingly the screen can also rotate or lie flat, effectively turning the new Classmate into a tablet PC. The device also comes with an accelerometer that ensures what is showing on the screen is in line with the screen's orientation. Intel claims are that users should get 8.5 hours of operation on a full charge of the Classmate's battery. 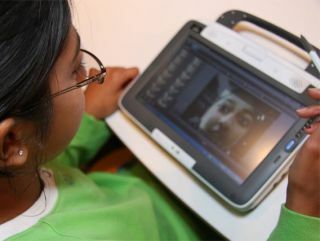 Intel clearly sees the primary education sector in emerging markets as a huge potential growth area for its low-cost Classmate technology.